Jews began to settle in Kėdainiai in the beginning of the 17th century. In 1627 residents of other towns of the GDL (Grand Duchy of Lithuania) and Poland were allowed unrestrictedly to come and leave Kėdainiai, among them – ‘fair and well-behaved Jews’. Jews in the town were subject to the manor, but not the town’s municipality jurisdiction. For their settlement a particular area by the Old Market Square was located. Jews of Kėdainiai mostly earned their living by trade and tenancy of taverns and customs-houses. As all residents of Kėdainiai, Jews were also charged to common obligations: to join into guilds, keep night watch, take an oath of the settled life, participate in military inspection as well as contribute to the building of the new town-hall. The first synagogue of Kėdainiai was built by the Old Market Square in the 2nd half of the 17th century. In the 17th century, the Jewish kahal of Kėdainiai, having developed and risen, became a centre of the whole Jewish district in Samogitia - Medinat Samut. Exactly in the 2nd half of the 17th century, the Old Market Square in Kėdainiai was named the Jewish Market Square. The Rabbis of Kėdainiai of the Katsenelenbogen family were famous as good judges of Talmud. Therefore, Kėdainiai became a studying place of Eliyahu ben Shlomo Zalman – the future Vilna Gaon, who arrived to Kėdainiai in 1727, had lived there for several years and married a local girl named Chana. During the whole 18th century Kėdainiai Jewish kahal and district were one of the most important ones in the GDL. After Synagogue of Belarus and Minsk district, they used to pay the third biggest capitation tax in the whole GDL. Kėdainiai was a residential place for the supreme rabbis of Samogitia. According to the date of Kėdainiai town inventory, in 1765 Kėdainiai Jewish community that consisted of 69 families, had two synagogues, a bathhouse and a hospital. At that time, Jews made a majority of the town’s craftsmen; many of them were joined in guilds of tailors, embroiderers and hatters. Jewish weavers were especially famous and preserved this craft in their hands as far as till the 19th century. 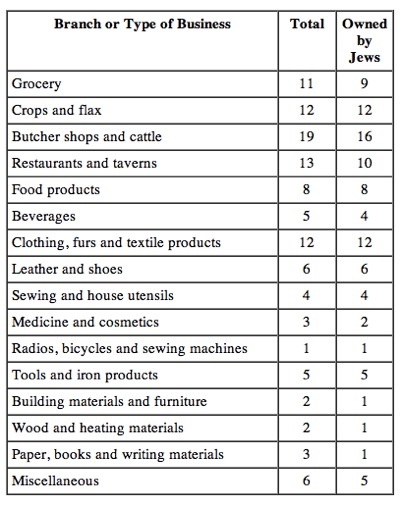 Crafts of blacksmith, tinsmith, butcher and tanner were also exceptionally in Jews hands. In 1784, at the northern edge of the Jewish Market Square, in a place of a synagogue that burnt down in the 2nd half of the 17th century, a new stone, summer synagogue of the Baroque style was built. Decoration of its interior was completed in 1807. The Jews used to say that this synagogue was the most beautiful in the whole Lithuania. In 1837, near the Big synagogue, the second one – the Little, or winter synagogue, was built. The latter had no such luxury interior, however heated. 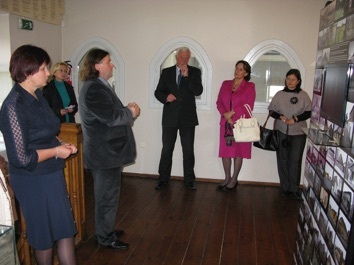 The biggest part of the building was a solid one-storey room, where men used to pray, in the rest part of the building, at the first floor, a court of the Jewish community used to sit. Culprits used to be imprisoned in a small butcher’s house, built by the Little synagogue, where, apart a prison, there also was a house of a butcher, who in special way used to butcher birds and livestock for the Jewish food. The house and the Little synagogue were connected by white arched gate leading into the yard of the synagogues. On a top of the gate there was a sundial. In a middle of the sundial there was a metal stick, whose shadow used to fall on a rounded clock-face, where in stead of numbers there were Hebrew letters that showed an exact sun time. In 1880 in Kėdainiai there were 7 prayer houses and schools: a synagogue, prayer house ‘Beit – Tamidrash’ by a synagogue, a new big school ‘Klauz’ in Smilga Street, a prayer school ‘Kabronese Schul’ in Mokykla Street, a prayer school ‘Shiva Kruim’, a prayer school of Leizeris Remigolskis and a synagogue beyond the Nevėžis River. 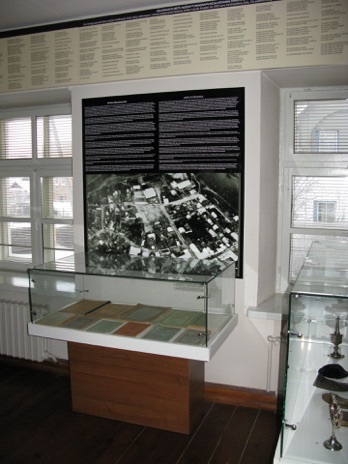 In the beginning of the 20th century Jews of Kėdainiai had 8-9 prayer houses. In 1881, when the tsar government had prohibited Jews to earn their living by agriculture and live in countryside, they on a mass scale began to move to towns. 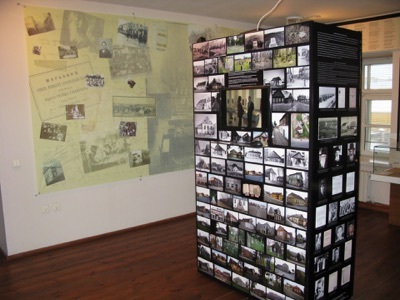 Therefore, in 1897, in Kėdainiai there lived 3733 Jews, making 61% of the town’s population. 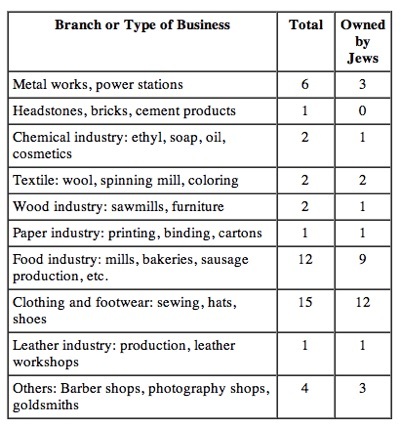 At that time, among Jewish craftsmen of Kėdainiai there were 85 shoemakers, 45 tailors, 35 bakers, 22 carpenters, 17 bricklayers, 8 blacksmiths, 35 hatters etc. Thanks to Jews, a business of cucumbers had gained ground in Kėdainiai since the 2nd half of the 19th century. There were the biggest areas of cucumbers in the whole Baltic region. Every year in Kėdainiai there were grown about 100 hundredweights of cucumbers’ seeds, 300 thousand of cucumbers and tomatoes sprouts. Every year cucumbers were grown in about 150 ha. During the interwar period Kėdainiai Jewish community had lived a pretty real value life: there were acting schools, an orphanage, bathhouse, the Jewish National Bank, nursing home and a fire-brigade. There were also a lot of the Jewish cultural, social and political organizations. Kėdainiai Jewish charity, social aid and cultural association ‘Ezro’ was particularly famous. It owned some buildings that used to be hired out for needy nationals. In 1923, according to the data of population census, in Kėdainiai there lived 2499 Jews, making 34% of all population. Jews made an absolute majority of Kėdainiai businessmen of that time. 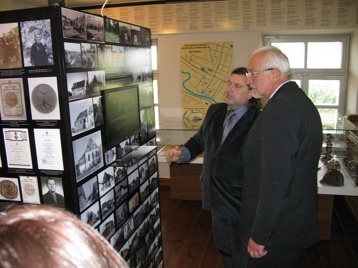 Besides, they also constantly participated in activity of Kėdainiai town municipality. 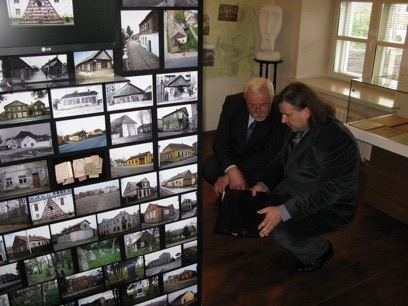 Unfortunately, the 300 years history of Kėdainiai Jewish community was broken by the Holocaust. On August 28, 1941, in a village of Daukšiai, near Smilga rivulet, local Lithuanian sidekicks led by the Nazis had shot down 2076 Jews of Kėdainiai, Šėta and Žeimiai. Once the community was destroyed, its property was plundered, the butcher house was demolished, of the Big synagogue was turned into stabling. During the Soviet period the Old Market Square was called National Square, the synagogues were turned into warehouses, and in place of a bigger part of Paeismilgis Street houses, multistory residential houses of silicate bricks were built. After re-establishment of independence of Lithuania, the old names of the Old Market Square and Žydų Street were returned. In 1993, one of the three survived synagogues, situated in Smilga Street, was restored and returned to Lithuania Jewish community. 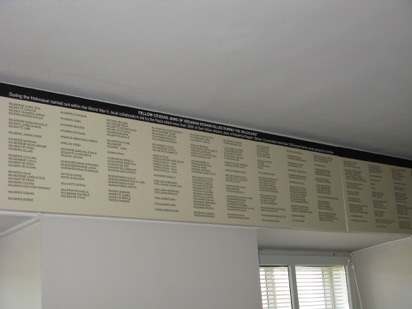 In September, 1997, commemorating the 200 anniversary of Vilna Gaon Eliyahu death, on the synagogue memorial plaques in Hebrew and Lithuanian languages were unveiled. 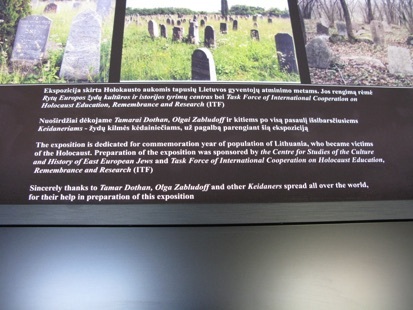 The Little synagogue was restored by resources of Department of Cultural Heritage and Kėdainiai municipality, where the Multicultural Centre of Kėdainiai Regional Museum was opened in, and in summer of 2004 Kėdainiai Art School was housed in the Big synagogue. The tragedy of the Jewish nation that took place during World War II struck also Kėdainiai region. In 1941, in Kėdainiai district local collaborationists led by the Nazis killed more than 3000 their fellow citizens and within few days broke the history of the community that lived together with Lithuanians for centuries. Unfortunately, to save the neighbouring Jews from death was very complicated. However, in Lithuania there were people, who regardless of danger to their families, dared to take a risk and resist the Nazi inhumanity. More than 2700 citizens of Lithuania saved Jews and were conferred a decorations of the Republic of Lithuania – Life Saving Crosses. More than 830 of them were recognized by the state of Israel as the Righteous Among the Nations. 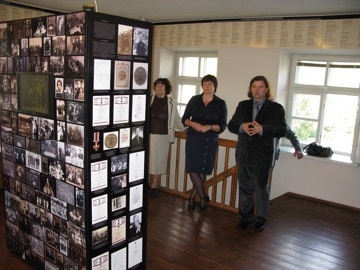 At the present time several families of Kėdainiai region that saved Jews and were given this honourable name are known: Vincas, Stasė, Jonas and Veronika the Antanaičiai, Juozas and Ona the Augustinavičiai, Aleksandra and Juozas the Bieliūnai, Petras and Liudvika the Gedaikos, Stasys, Barbora and Vytautas the Kšanavičiai, Juzefa Rimavičienė, Jeronimas and Adelė the Žiužniai and Zenonas Grigaitis. Vladas Antanavičius and Algirdas Mykolas Dobrovolskis – Father Stanislovas OFM Cap. – are conferred Life Saving Crosses. In 2007, during the award ceremony, a President of Republic of Lithuania Valdas Admakus said: ‘Those, who saved Jews were and would be always considered mouthpieces of the real attitude of Lithuanians and Lithuania towards the Jewish tragedy and the historical injustice of that time. I am truly grateful to You, savers of the Jews and savers of Lithuania honour’. On August 23, 1939 the Nazi Germany and the Stalin Soviet Union signed the Molotov-Ribbentrop pact and in September they started to divide Europe attacking Poland each after another and thus starting World War II – the most cruel and bloody war in the history of mankind. In October 1939, thousands of war refugees started to move from Poland towards Vilnius that at that time was returned to Lithuania by the Soviets. Regardless of complex international and domestic situation, the Republic of Lithuania sheltered tem all. The absolute majority of the refugees were Jews who tried to save their lives from the anti-Semitic Nazi and atheistic Soviet policy. Among them there were members of various Jewish religious schools and organizations that acted once in Poland. Teachers and students of the Yeshiva (Rabbi seminary), one of the most famous Jewish religious school of Mir (the present Belarus) that got to the territory occupied by the Soviets, also decided to escape. In the end of 1939 they arrived to Vilnius and found here a city overcrowded by war refugees and there was no place to settle. 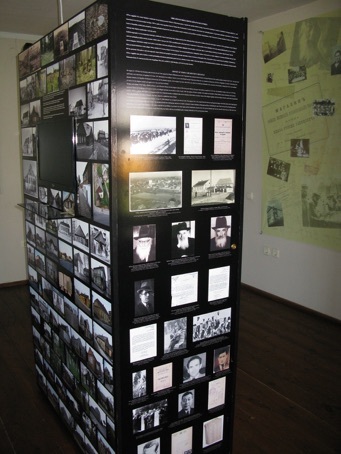 In early 1940, the teachers of Yeshiva together with students and members of their families came to Kėdainiai and found here a secure shelter to continue their studies in synagogues of the town. Kėdainiai became a residential place also for families of the Yeshiva members. Some of the refugees together with local religious Zionists could cultivate agriculture and prepare themselves for a trip to Palestine, where they planned to establish the state of Israel. Unfortunately, their peace in Kėdainiai was too short: on June 15, 1940 Lithuania was occupied by the Soviet Union. The religious Jews, who escaped from the Soviets, faced again the danger of the Stalin atheists that fought against every religion. Therefore, leadership of the Yeshiva Mir decided to divide into small groups and move to smaller settlements: Krakės, Krekenava, Ramygala and Šėta. Anticipating the end of the Soviet and Nazi friendship and the approaching war, in August 1940, members of the Yeshiva used the last possibilities to get transit visas from Japan and the Netherlands consulates that still acted in Lithuania and were not closed by the Soviets yet. With such visas they successfully reached the Far East. After the World War II, the saved Yeshiva Mir was re-established and worked in Brooklyn (USA) and Jerusalem (Israel).